3rd Post in one day, well I do have some time to make up. 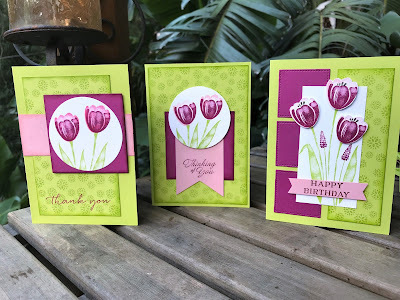 Today's post is using the Tranquil Tulips set. This set is exclusive to the hostess. There are 2 ways you can get your hands on one of these. 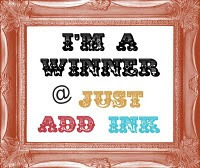 1st one is to host a workshop in your own home and invite all your crafty friends. If your sales reach $250 or more you earn $$$$ to spend free. Use your free dollars to on products in the catalogue including the exclusive hostess sets and vastly reduced prices. The 2nd way is to do an on line order and spend $250 dollars and earn free $$$ and have it delivered straight to your own door. I focused on using 3 of the new in colours, Berry Burst, Lemon Lime Twist and Powder Pink. They just go so well together. 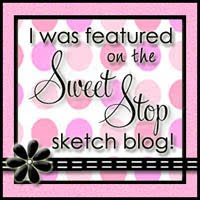 I did use one of the stamps from another hostess set 'Background Bits' to do the background stamping. Sentiments are from various sets.